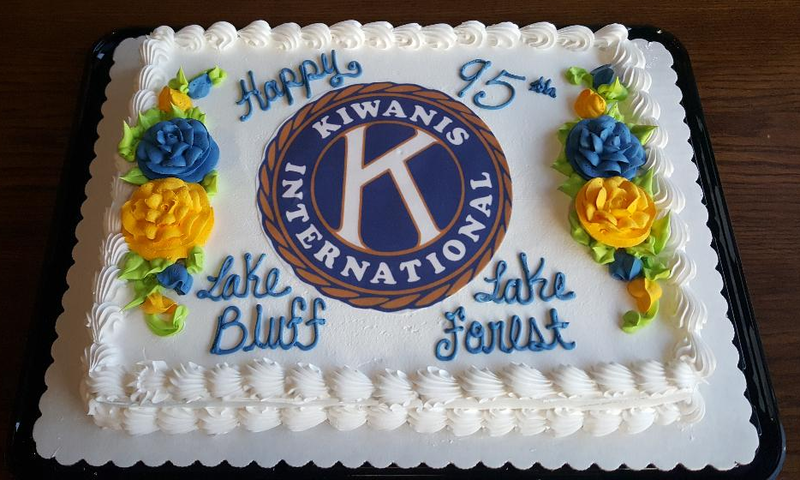 Happy 95th Birthday Lake Bluff – Lake Forest Kiwanis! On March 15, 1923, ninety-five years ago, the Lake Bluff-Lake Forest Kiwanis Club was founded. The service-oriented mission and the Club’s motto is “Serving the Children of the World”. Today the Club has 23 members – including seven women, something which was not permitted before 1987. Right now, approximately 15 organizations in Lake Bluff, Lake Forest, North Chicago and Lake County receive annual contributions from the Club including Reading Power, Mother’s Trust Foundation, CROYA, Zacharias, Max Schewitz Foundation, LEAD, and the Boys and Girls Club. In the past year, the Club has also been focusing on distinct “projects”. Backpacks with books were provided t 125 kindergartners in North Chicago – this will be an annual event! Funding for four Samrt Boards was given to the Lake Bluff Preschool. Financing was provided to the Lake Bluff Middle School for a handicapped ramp and also chairs and instruments for the Band Program. Just this month, funds were given to GLASA to purchase an adaptive track and all-court chairs for sports activities for handicapped children at Lake Forest High School. “To Serve the Children” is the motto of the Lake Bluff and Lake Forest Kiwanis Foundation. 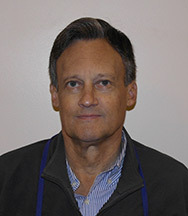 Mike Redding, a foundation member, in communicating with GLASA staff, discovered their need for two all court chairs and one track chair. 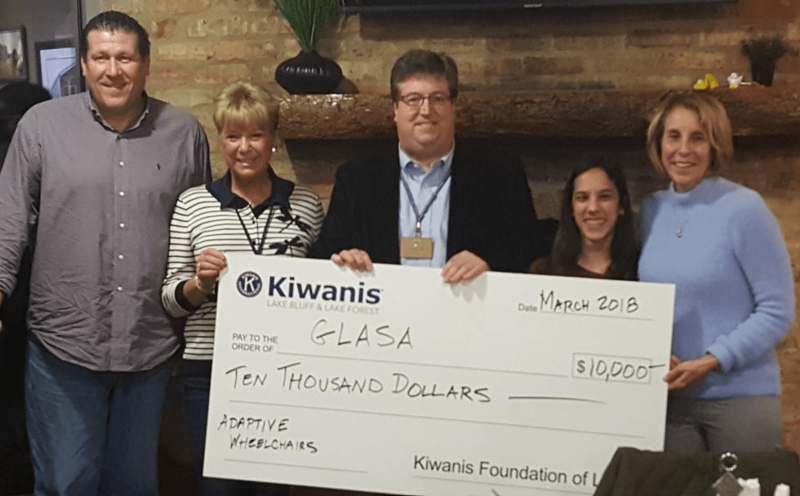 Mike invited Cherie Hrusovsky – Development Director, Tom Daly – Equipment Director, and Julia Tanna – Lake Forest student in the GLASA program to attend Kiwanis’ bi-monthly meeting to introduce members to the goals of GLASA. Also in attendance were Julia’s mom, Dr. Carola Tanna, and Areta Verschoor, GLASA volunteer. Cherie and Tom explained that the Great Lakes Adaptive Sports Association (GLASA) is an organization that provides sports programming to individuals with physical and visual disabilities and promotes their physical and mental well-being. The organization encourages individuals to participate in one of the many activities offered, for example, wheelchair basketball, football, soccer – to name a few. The education and outreach programs are facilitated by over 600 volunteers! Julia commented how GLASA has been her support system at Lake Forest High School. David Lee, Foundation President, presented the surprise check for the adaptive chairs, which caught everyone by surprise with many smiles and tears! Accepting the check were Cherie Hrusovky, Tom Daly, and Julia Tanna. Please consider helping the foundation, P.O. Box 34, Lake Bluff, IL 60044. The Lake Bluff Park District had their grand opening for their newly installed SMART boards and projectors. This is a project the District had been fundraising for a while but were years away from being able to purchase the equipment. This is where the Kiwanis Foundation of Lake Bluff & Lake Forest stepped in… they donated the necessary $10,000 to purchase the Smart boards and projectors for all four preschool classrooms. The funds raised by the District parents will be used to purchase laptop computers to be used in conjunction with the SMART boards. The teachers and staff are extremely thankful of the donation from Kiwanis, and can hardly wait to incorporate them into their classroom actvity. David Lee, President Kiwanis Foundation, said “this project fit perfectly with our objectives of “Serving the Children” and that we are excited to see the children learning with technology.” Lee mentioned that the Foundation hopes to make significant donations yearly to area organizations that will positively impact our children. All Kindergartener’s at the Evelyn Alexander School (formerly North Elementary School) in North Chicago were excited to receive new backpacks and reading/picture books at their “meet and greet” night. Principal Orbe thanked the Kiwanis Foundation of Lake Bluff & Lake Forest for their generous donation stating, “What a thoughtful donation for children starting school.” He even mentioned that some students immediately sat down and started looking through their new books. The Kiwanis Foundation selected Evelyn Alexander School as a few of their members are involved with Reading Power, Inc., a non-profit organization which tutors students in reading at the school. Maureen Biedermann, a former teacher, member and tutor, was instrumental in organizing the donation. She saw a smile on all the children’s faces and believes this is a great introduction for student to school, let alone reading. The Kiwanis Foundation hopes to provide backpacks and books every year. “It fits perfectly with the Kiwanis’ motto of Serving the Children,” said President, David Lee. KIWANIS appreciates all the sponsors of the 4th of July Pancake Breakfast and Cookout. Their support does not go unnoticed. Thank You! James Bert Gillen of Lake Bluff, loving husband of Sherry and proud father of Jack, Caroline and Cassie, passed away peacefully at the age of 64 after a courageous eighteen-year battle with cancer. He is also survived by his sister, Maralee Murphy, nee Gillenberg, and countless loving relatives and friends. Born in Lake Forest and raised in Lake Bluff, Jim attended Lake Forest High School and then Carthage College where he received a BA in business, served as president of the Tau Sigma Phi fraternity, and met Sherry. Later, Jim earned an MBA from Marquette University, became a CPA, and worked in the fields of accounting, finance, and technology. Jim raised his family in his beloved Lake Bluff where, like his parents, Bert and Agnes Gillenberg, he was an active member of the community. Among other involvements, Jim served as president of the Kiwanis Club of Lake Bluff and Lake Forest, was a community leader in “Vote Lake Bluff”, and hosted foreign exchange students. An avid sportsman, Jim loved playing baseball, golf, and attending Scouts basketball games and Packer football games. After spending several seasons as a little league and soccer coach, Jim founded Pro-Vest, a company that designed and sold sports-safety equipment and acquired several patents for his line of protective vests and pads. Jim also loved the outdoors. Mostly, he loved Ely, Minnesota and Bear Island Lake where he camped, boated, and waterskied at night under the northern lights. He was a passionate man; he was passionate about cancer research and self-advocacy. He was passionate about the disabled community in our midst as personified by his beautiful daughters. But mostly, he was passionate about the simple things in his wonderful life like: playing the guitar, flipping Kiwanis pancakes, reading biographies, playing euchre with friends, watching “Survivor” with Jack, and angel food cake. A memorial service will be held on January 28th at 11 am at the First Presbyterian Church of Lake Forest. Dean Milton Holm was born in Renner, South Dakota to Bert and Minerva (Christiansen) Holm on December 18, 1930. He grew up on a farm near Baltic, South Dakota and graduated from high school in Lyons, South Dakota. After serving in the Air Force during the Korean War, he attended college at the University of South Dakota. After he graduated from college he moved to Detroit, Michigan where he was employed by General Motors for three years. He then moved to Iowa where he took a job as a computer systems manager at Collins Radio Company where he met his wife Faye. After Dean and Faye were married and welcomed their second daughter they were transferred to Dallas, Texas. After a short period in Dallas, Dean accepted a position with Abbott Laboratories as the Director of Management Information Systems. Dean stayed at Abbott for 26 years before he retired in 1993. Dean was a member of St. James Lutheran Church for almost 50 years. He was very active in his church and served on several committees. He also served as president of the Church Council for two separate terms. 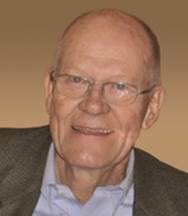 He was a member of the local Kiwanis Club for almost 45 years and served on the zoning board of appeals in Lake Bluff. Dean also served as a board member of the Family Services Agency of Lake County and the Clara Abbott Foundation. Dean received his Masters of Business Administration from the University of Chicago in 1972. Dean passed away peacefully at Balmoral in Lake Forest on August 6, 2016. He was grateful to have shared his life and is survived by his loving wife Faye of 55 years, his daughter Alison (Kurt) Kohlmeyer of Lake Forest, his daughter Andrea Haller of Lake Bluff, his granddaughter Morgan Kohlmeyer and his grandsons Christian Kohlmeyer, Addison Haller and Ethan Haller. He was preceded in death by his parents, his sister Marilyn, his brother Vern and his daughter Alicia. A memorial visitation will be held at Wenban Funeral Home 320 E. Vine Ave., Lake Forest, IL 60045 on Friday, August 26 from 5-8 PM. In addition, the family welcomes you to attend a funeral service for Dean at St. James Lutheran Church, 1380 N. Waukegan Rd., Lake Forest on Saturday, August 27 at 11 AM followed by a reception. In lieu of flowers, please consider a donation to the Kiwanis Foundation of Lake Bluff and Lake Forest, PO Box 34, Lake Bluff, IL 60044. There is a $0.25 per page plus postage cost.